According to LinkedIn, the healthcare and pharmaceutical industry has one of the highest talent turnover rates. Life science companies must be able to attract and retain their highly skilled employees to ensure that knowledge is kept within the business. Staff retention is also important in reducing the loss of productivity and cost of recruiting new staff. If your organisation suffers from high staff turnover and you want to improve employee retention, begin by asking yourself these 5 questions. Is your working culture magnetic? One of the biggest challenges that life science companies can face is a lack of awareness of their brand across the industry. Conversations ProClinical has with candidates everyday reveal that even some of the best selling drugs are produced by companies few recognise. Companies are in constant competition for the best talent, so it’s extremely important to ensure your workplace culture attracts and retains employees. The key to employee retention is create an environment where people can see the impact of their actions every day, and to look after and develop them better than your competitors do. Your employer brand plays a huge role in this - it describes a ‘sense’ of what the company is about and helps them form a connection. So, when the option to join another company arises, they won’t want to. In the life science industry, important things to get across to employees is that you’re patient-centric, passionate about healthcare and ahead of the curve in terms of technological advancement and innovation. There are many more questions to ask. Is your workplace diverse enough? Do your values match theirs? What do you do to make your employees proud to work for the organisation? How do you uphold employee motivation? Do you have innovative staff engagement ideas? Do you give creative people space to innovate? Giving employees room to challenge themselves and innovate freely is something that Roche’s CEO, Severin Schwan believes is the key to employee satisfaction. 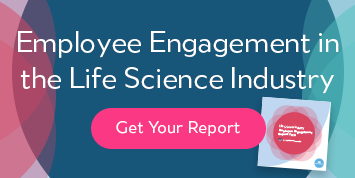 This is backed up by findings from ProClinical’s employment engagement survey, which listed challenging work and the ability to influence and innovate as the top influences on engagement for life science employees in the USA and Europe. Schwan believes that “creative people need air to breathe and freedom to follow their own passion, conviction and dreams, which is fundamental to innovation. If you tell them what to do and bury them in standard operating procedures, you’ll never get anything new.” This suggests that by stepping back and giving employees the freedom that they crave, you will also build a more innovative working environment. This benefits both employee and organisation. Do you celebrate failures as much as successes? You’ll agree that it’s the tireless determination of employees to plough ahead in the face of likely failure that leads to the medical discoveries that keep the company innovating. In Silicon Valley, a place renowned for its creativity and innovation, celebrating failure is their mantra. The best companies realise that failures are just lessons on the path to success. For example, at Roche, Schwan takes the time to personally congratulate all participants and thank them for their hard work regardless of success “because innovation is all about taking risks and accepting failure." This is especially true in the life science industry where research projects and clinical trials fail more often than they succeed. Failures in this type of work are more important than usual because they lead to the most effective drugs for patients, as everything that doesn’t work or may be harmful to them has already been written off. Also, analysing what went wrong with one drug trial could help prevent future failures. Are you providing adequate learning and development opportunities? LinkedIn surveyed over 10,000 people who recently left their jobs and found that a lack of opportunities for advancement was the primary reason people jumped ship. One of the key things that employees care about is whether their employer is invested in their future. Yet, according to ProClinical’s engagement report, employees do not believe they receive adequate career support and development opportunities, despite this being fundamental to their engagement at the company. As few as 38% of life science employees across the whole of Europe are satisfied with their career development. So, if you’re looking to improve employee retention, it’s really important to know whether the current learning and development opportunities are fulfilling your employees’ needs. If not, work on ways to improve the opportunities available to them. Consider career development programmes, encouraging career-focused discussions or holding workshops/training sessions to help them develop their skills. It could be as simple as communicating with them more about where their career is heading within the organisation. Is executive leadership at your company the best it could be? There’s a well-known saying in the business world that people don’t leave companies, they leave managers. While there are many things you can do to improve leadership skills of managers at your organisation, many underestimate the impact good leadership at executive level has on employees. Employees like to have a sense of direction and purpose in their day-to-day, and this is something that many employees would leave better paying jobs to have. Hearing about the organisation’s mission - and how they contribute to it - from the company’s leaders themselves can really boost employee motivation. ProClinical’s employee engagement report includes many more useful insights that will help you improve employee retention at your company. Download your regional engagement report today and find out what makes life science employees tick!